March is Women’s History Month. The DeKalb Chamber of Commerce will be recognizing women in DeKalb who have made a significant contribution in their respective industries and in our community. This week we are highlighting two women making a difference in their respective nonprofit organizations: Maria Balais of Leadership DeKalb and Debbie McMinn of The Salvation Army Metro Atlanta. We are fortunate to have a great community partner like Leadership DeKalb. The organization helps to inform emerging and established leaders about ways to make a difference DeKalb County. 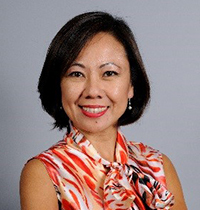 Behind the organization is Maria Balais, a leader who has transformed the organization and its leadership program. My favorite place in DeKalb County is Downtown Decatur. It’s a great place to work and play. It has some of the best restaurants in the metro area. My mother always told me to try to leave a place better than when you found it. She usually meant that I should pick-up after myself when leaving a friend’s house, but I’ve taken this advice to heart and applied it to my community and professional work, too. What is notable about your role/contribution to your company? I’m very proud of what I’ve been able to bring to the table at Leadership DeKalb. I’ve updated the program and made it more relevant to the current climate in our community. For example, we brought in Al Vivian, one of the best Diversity consultants in the nation to facilitate our Diversity & Inclusion Day; we added the Integrity & Ethics Program Day in 2015; and I incorporated the Community Service Projects, impacting 34 Nonprofit Organizations in DeKalb County to-date. And most recently, we are piloting a young leaders program called the Emerging Leaders of DeKalb which has 25 very talented young leaders in the class. I am proud and committed to ensuring we have the next generation of leaders who will take DeKalb County to the next level. For more information on Maria, click here. If you are a new member, you may have received a personal phone call from Debbie McMinn welcoming you to the organization. Debbie serves on our Membership Engagement Committee and helps us find ways to engage with the nonprofit community. 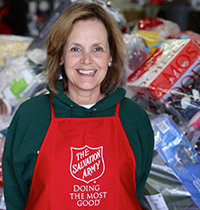 With Debbie’s help, DeKalb Chamber members were able to participate in The Salvation Army’s Angel Tree program and provide 25 local children and seniors with holiday gifts. I love, love, love the DeKalb Farmers Market! I love the hustle and bustle, the smells, the amazing variety of foods, spices, plants, breads and people! It’s exhilarating and I always buy too many fruits and vegetables that I end up sharing with others so they can be consumed while fresh and crisp! I’m just amazed at how much I can purchase for such a minimal cost. It’s an adventure! I also have tremendously enjoyed getting involved with our DeKalb Chamber of Commerce. I have met so many kind and generous people through the Chamber and enjoy serving the community along side them! I was a banker for over 16 years here in the metro area and enjoyed the benefits of serving many through the retail branches starting as a part-time teller. I moved up through the ranks, I like to say I grew up in banking. I managed many different retail branch locations becoming a Vice President in the Human Resources Community Development Division. At a pinnacle time in my life I decided to make some changes and decided I wanted to do more in serving my community. I started at the United Way of Metro Atlanta, which was a wonderful training ground for working in the nonprofit sector, but decided that I was ready to be on the ground closer to the work and serving others. I naturally gravitated toward finance, so what better way to serve others then by raising money to help those most in need. I now work at The Salvation Army Metro Atlanta Area Command as a Major Gifts Manager. It’s an honor and privilege to serve with this great organization. The Salvation Army is a faith-based organization that serves the homeless, provides services to victims of human trafficking, and serves youth through our Salvation Army Boys and Girls Clubs. We do more than ring bells at Christmas! I love sharing the mission of The Salvation Army and how we help so many people here in metro Atlanta. Just last year we provided over 157,000 meals, provided 144,503 individuals with safe shelter and 34,304 toys and gifts were distributed to youth through our annual Angel Tree program. I am very proud to be a part of this work! To contact Debbie, click here. For more information about The Salvation Army, click here.